Bel-Aire Park is approximately 5.2 acres. It consists of an open field for sports with bleachers, a concession stand and a small tot lot. Restroom facilities and a paved parking lot is also located on the grounds. Located south of SW 216th Street and east of 97th Ave. 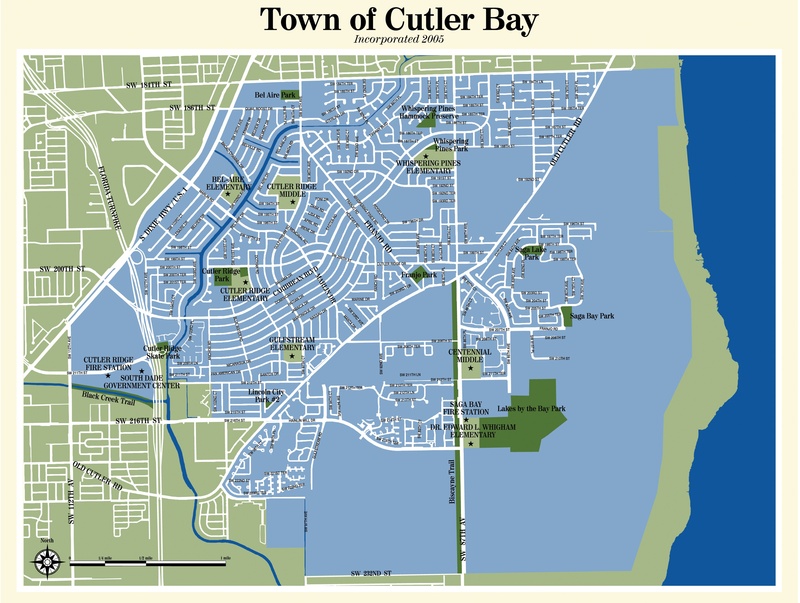 Consisting of 5.07 acre's, this is Cutler Bay's newest acquisition, approved in May of 2013. This park consist of a tree-lined pathway, perfect for a quiet walk. A small gazebo with seating overlooks the lake. No facilities or parking are available at this park. At approximately 11 total acres, Cutler Ridge Park is the second largest park within the town. The park consists of several open fields for sports activities and a public pool. Residents may swim in the pool during specifically designated hours (public swim times and fee's subject to change, phone 305-238-4166 for more information). Other hours are reserved for practice and swim meets as well as learn to swim classes. Cutler Ridge Park has a covered play area for children, benches, and picnic tables. The park has a large gazebo, a single tennis court, and a circular quarter mile walking path. Numerous athletics programs take place within the park. Located on the premises is a community center where the town holds after school activities, summer programs, senior citizen activities, and a variety of classes. The gazebo and community center are available for rent. Many special events take place on the grounds throughout the year, including the town's Chilli Cook-Off, Easter Egg Hunt, and Halloween Event. Free WiFi is available at this park (the password is cutlerbay). Franjo Park, was the first planned park in the area, built over thirty years ago. This 5 acre dedicated sports park, just off Old Cutler Road, consists of three lighted softball/baseball fields, batting cages, bleachers, picnic tables, and a concession stand. Restrooms and water fountains are available. Paved parking is available but limited. Lakes By The Bay Park is the town's largest park. Located behind Whigham Elementary School, this park consists of baseball fields and several multipurpose, lighted fields for soccer and football. A walking path with exercise stations and benches circle the park. A covered concession stand with bathroom facilities are located at the center of the park. There is a paved parking area with a nearby tot lot (tot lot not shown in aerial view) and an open playing field. Behind the parking area is an undeveloped natural area. Free WiFi is available at this park (the password is cutlerbay). SW 214th Street and 99th Ave.
Lincoln City Park is an undeveloped natural area on just over 1/2 acre. No facilities are located at this park. SW 205th Street and 80th Ave.
Saga Bay Park is home to four lighted tennis courts, along with a covered playground for the kids and a circular walking path with benches. One picnic table is available. A large open field is perfect for impromptu sports activities, throwing around a ball or Frisbee, or flying a kite. This 5 acre park includes bathroom facilities and a water fountain. A small paved parking lot is located on site. SW 198th Street and 83rd Ave.
Saga Lake Park is a 5 acre park which includes a small softball field, perfect for practice or a game with friends and neighbors. A small gazebo is located at the site along with a walking path, exercise stations, and picnic tables all set within view of the lake. There is an open field for Frisbee throwing, kickball, or other activities. Parking is available on the grassy area lining the park. No bathrooms or water fountain available. A canoe/kayak launch area is expected to open soon. Whispering Pines Park is a wonderful location to bring the kids. This 1½ acre park is located on a quite street ajoining Whispering Pines Elementary School. The park has a large covered playground, a gazebo with several picnic tables, and a large grassy area for free play. No water, bathroom or electrical facilities are located on the premises. Parking is available in the grass along the street. The town's Annual 4th of July parade and picnic takes place each year at this park. Black Point Marina is located just outside of Cutler Bay in unincorporated Miami-Dade County. The marina provides channel access to Biscayne Bay. Amenities include a marina and boat ramp, wet slips, fuel station, fishing areas, trails, picnic shelters, and the Black Point Ocean Grill restaurant. This thirty acre park is a gift of nature, with three distinct areas consisting of native pinelands, a drained Everglades slough, and tropical hammock. The main house has a live animal exhibit and 822 gallon freshwater aquarium. There are also nature trails, bird-watching, picnic shelters, and more. Hours are limited, so check their website for hours of operation. This lovely 50 acre park includes a walking/jogging bath, tennis facilities, picnic areas, sports fields, beach volleyball court, and much more. The Deering Estate is a local treasure, with tree covered grounds, a beautiful estate, and the location of many local events. It is a must see location for out of town visitors and locals alike. This three acre park has much to offer residents both in Palmeto Bay and the local community. With a 5,000 square foot library, community center, amphitheater, gazebo, and large grassy area, you'll find plenty of space to relax, walk, or bike along the nature trail. The park overlooks a wetland mangrove reserve. This 25 acre park features basketball courts, and a 6 field softball complex with 2 story concession stand and observation deck. There are tree-lined walkways with exercise station, picnic pavilion, a boundless playground for children of all abilities, covered picnic pavilions, recreation room, and other amenities. This historic 4.5 acre property has views of Biscayne Bay, a historic house for events, and a large expanse of green space with walking trails. Hours are limited. This Palmetto Bay park has gone to the dogs, literally. Located on 3 acres, this gated dog park offers amenities both dogs and owners will enjoy. With a lake, walking path, gazebo, and pet water fountain and wash area, this tree-filled park is a great place for your four-legged friend to have some fun.